At Element we recommend that you check your bike regularly or have one of our trained mechanics do it for you. When wear parts are replaced promptly, your bike will serve you well and give you pleasure for many years to come. Most manufacturers advise you to service your bike at least once a year to ensure your bike feels as meant to be. We are here to help with all your bike maintenance needs. It's also smart to be attentive to small problems with your bike. The moment you discover a problem, it is best to fix it right away. Often times, the longer you wait with maintenance of these small problems, the worse they become. For instance, if you let that stretched chain go too long, it will eventually wear down your cassette also. Leading to more costly repairs. Here are a few tips to keep you running smooth and safe for miles to come. Take a close look at your brake pads to check for wear and proper adjustment. Thoroughly clean the brake pads as well as the braking surface of the rims. This will extend the life of them both. Always use manufacturer recommended brake pads to ensure top braking performance and to maintain the safety of your braking system. If your bike needs maintenance, do not wait too long. Often times, the longer you wait, the worse the problem becomes. Be sure to take your bike to a professional mechanic or use the correct maintenance tools and cleaners if you work on your own bike. The tools are just as important as the components themselves. 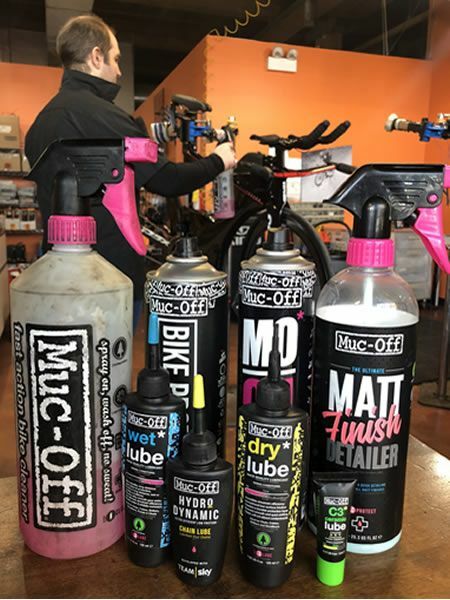 Our highly experienced mechanics will have your bike running like new using only Muc-Off products for cleaning and lubing of your bike and it’s components. Muc-Off Nano Tech Bike Cleaner is specially formulated to properly clean your bike without damaging the finish. After every two or three rides, we recommend that you wipe the chain off with a rag. Lubricate your bike drive chain immediately after use if you are riding in challenging conditions, such as the lakefront bike path (sand is bad for your chain), or riding in the rain or other wet conditions. Also, clean and lubricate the drive chain on your bicycle if you notice it becoming dry, sounding noisy or if the chain links bind in any way. Using the proper lubricant will ensure the chain works correctly and can help to extend the life of the chain, as well as your cassette. We recommend Muc-Off brand lubricants for speed and corrosion protection. An added bonus is that they are solvent free, so this lube is safe for you and the environment. Follow these tips and your bike will perform at its best when you need it. Is it time for some maintenance on your bike? Bring it in to Element for one of our Tune Up Packages and we’ll take care of it for you.